Okay, Sea-Fever has gotten a little art happy lately, I know. But there is so much contemporary art that has some kind of maritime angle that I find interesting. Art, after the sea, is one of my deepest passions so that’s why I post about it. If you aren’t interested, don’t worry, I won’t take it personally if you skip a post or 2; just make sure you come back. Please! Earlier this week the largest public art project in NYC since Christo’s Gates in 2005 opened in various sites along the city’s waterfront. “New York City Waterfalls” by Danish Icelandic artist Olafur Eliasson consists of 4 large temporary manmade waterfalls on the East River. The project is reported to have cost nearly $15.5 million of public support, foundation funds and private donations. The Public Art Fund is the main sponsor of the project. Given that much of New York City is surrounded by water, the idea of creating waterfalls seemed obvious to Mr. Eliasson, who suggests that New Yorkers are not as strongly connected to their waterfronts as urban Europeans are. Well from the articles I’ve read and pictures that I’ve seen I’m completely underwhelmed. I love contemporary art that challenges and really want to like this project. But there’s something about this piece that makes it appear to be a caricature or parody of contemporary art. 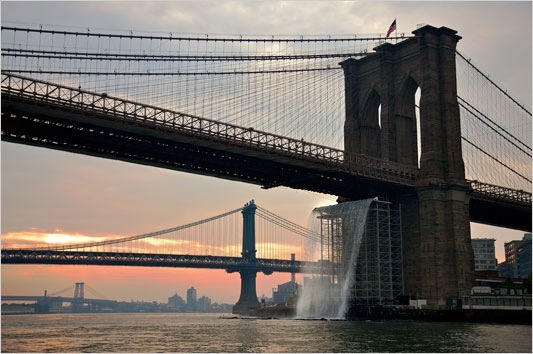 Personally, I have trouble seeing past all of the scaffolding and not thinking of other NYC waterfalls like this. I know I should reserve judgement until experiencing it firsthand so maybe we’ll make a trip to NYC to check it out before it closes in October; hope we’re not disappointed.